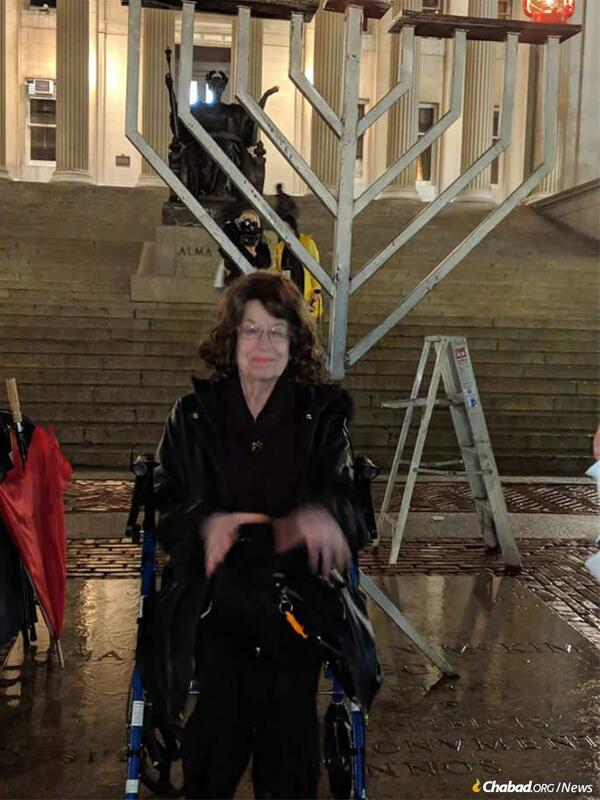 Professor Elizabeth Midlarsky, a psychology and education scholar whose office was vandalized with anti-Semitic images last week, lit the first candle of the Columbia University campus menorah in front of the famed Low Library. 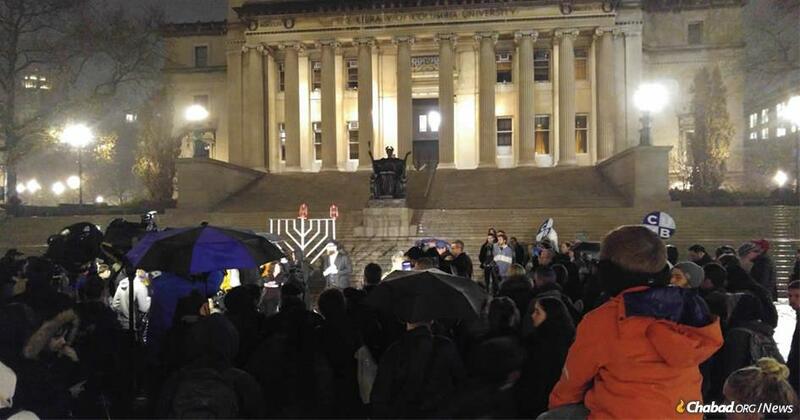 Joined by students and faculty, including Nobel Prize laureates, a Columbia Teachers College professor whose office was vandalized with anti-Semitic images last week lit the first candle of the Columbia University campus menorah in front of the famed Low Library. Professor Elizabeth Midlarsky, a psychology and education scholar whose work includes Holocaust studies, discovered her office at 120th Street near Broadway defaced with two large spray-painted swastikas and an anti-Semitic slur last Wednesday. Her office was vandalized in 2007 as well. 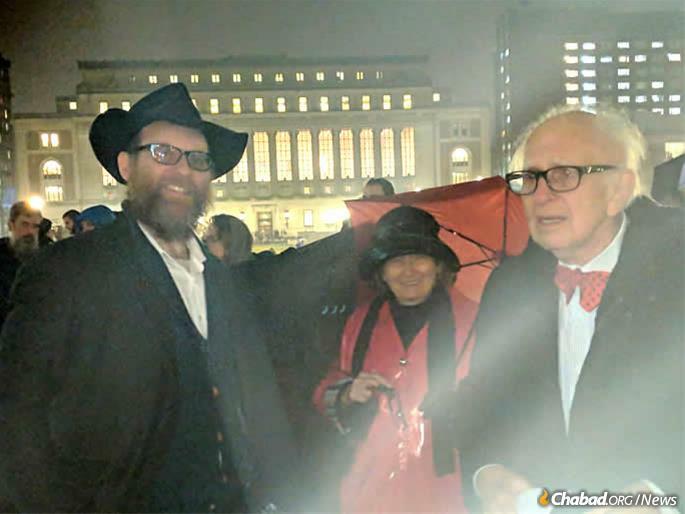 On learning of the attack, Rabbi Yonah Blum, who with his wife, Keren, co-directs Chabad at Columbia University, reached out to Midlarsky, who has been a guest at their Chanukah celebrations in the past. “How else can you respond to what happened besides turning it around and making something positive of it?” asks Blum. The proper response, he says, will be a large turnout at nightly menorah-lightings on campus, where students will be joined by campus leaders and dignitaries. Chanukah, which lasts for eight nights, teaches not only the message of light over darkness, but also the method for achieving it, Blum tells Chabad.org. “It’s using light and education to defeat hatred, ignorance and intolerance, which is particularly important at a place like Columbia University—a place of higher education,” explains the rabbi. Sunday night’s menorah-lighting took place in front of Low Library, and included cider, doughnuts and a marching band. 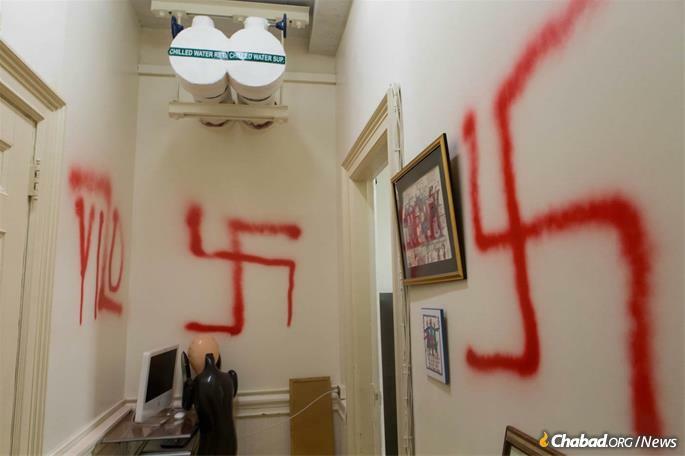 Midlarsky's office was defaced with two large spray-painted swastikas and an anti-Semitic slur. L to R: Rabbi Yonah Blum, Denise Kandel ad Nobel laureate Eric Kandel.